'Scarlet Belle' is one of the shorter varieties of pitcher plants, and is a good choice for the terrarium. 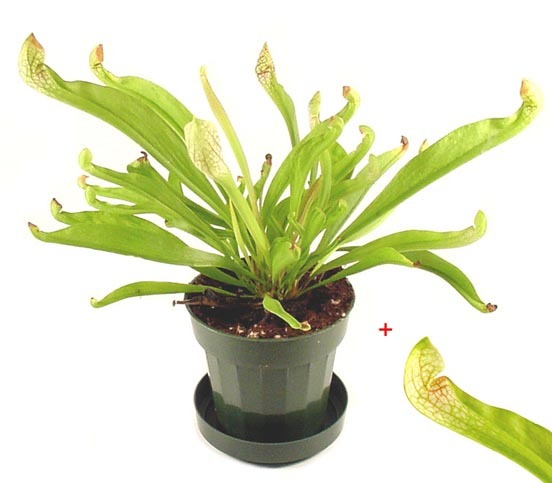 It is a hybrid between the White-top pitcher plant, Sarracenia leucophylla, and the Parrot Pitcher plant, Sarracenia psittacina. When grown in bright light, the tops of the pitchers turn deep red with white speckles, which is truly a fantastic sight! The plants come ready to grow in 3-inch pots.